Stephen Curry scored 51 points on 15-of-24 shooting Wednesday night as the Golden State Warriors manhandled the Wizards, 144-122. Six Wizards players scored in double figures. Bradley Beal led the pack with 23 points and Kelly Oubre added 17 off the bench. However, it was not enough as Stephen Curry stole the show with his shooting acrobatics. In typical Warriors fashion, Golden State raced out to a quick lead in this one. But give Washington credit as they were able to stay within striking distance even with Curry being Curry. Washington remained only down 11 at the end of the first quarter and trimmed it down to single digits by halftime. But the Wizards defense looked hopeless in this one. 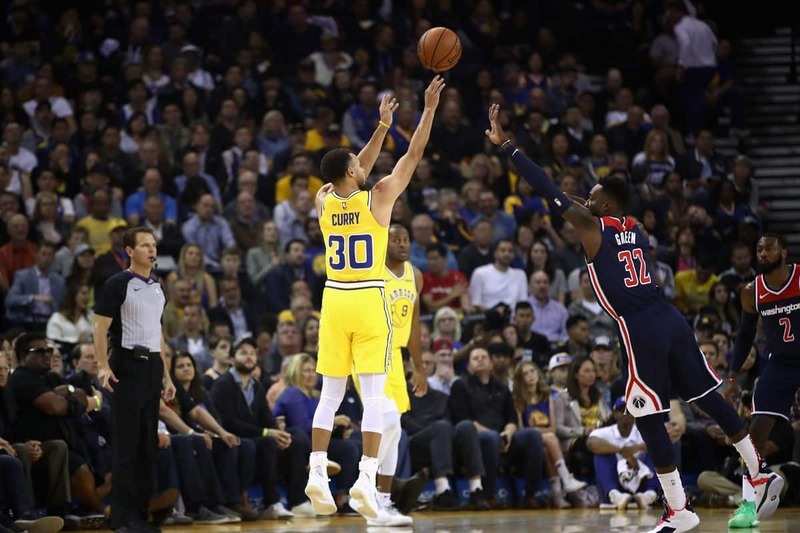 Curry hit one three-pointer after another in the third period highlighted by a sequence where an alley-oop attempt from Curry to Durant was broken up by Beal. Then, Curry drained yet another three from the corner and got fouled. Curry scored 51 points on 24 shots and this one became so lopsided that Curry didn’t need to play in the fourth quarter. All you can do is tip your cap on a night like this and move onto the next one. Wizards fall 144-122. This dude is just unfair. That might be the only sentence you can use when describing Stephen Curry’s outing against the Wizards. Midway through the opening period, Curry did his dance against Tomas Satoransky which led to him shaking free for a three and drew a huge ovation from the crowd. Just seconds later, Curry hit yet another deep three which looked so easy for him. Curry ended the period with 23 points on 8-11 shooting and knocked down five of his six three point attempts. Even more impressively, he scored 18 of the final 20 points for Golden State to close out the period. There’s not much you can do when Curry is in one of these zones besides hoping he cools down before it’s too late. For the second game in a row, the small ball lineup proved to be fairly effective as the Wizards were able to hang around in this one in the first half. Kelly Oubre had a strong half leading the Wizards with 15 points as he stepped in nicely while Beal was hurt in the first quarter. Jeff Green added 10 points as the Wizards were able to score 71 in the first half. This is where all of the positives run out. They gave up 80 and went on to give up many more throughout the game. For as good as the small ball offense was, rebounding and defense still remains a major problem. It will be something to keep an eye on as the Wizards aren’t trotting a true center out there. Rookie Troy Brown Jr. and Thomas Bryant got their first taste of action with the Wizards in garbage time tonight. Jordan McRae, who played 11 seconds in the season opener, got over 12 minutes of playing time in this one. They proved to be very effective as Troy instantly displayed his defense by intercepting a pass for his first glimpse of NBA action. Thomas Bryant added 6 points and 4 rebounds on 1-5 shooting but it will only get better from here for Bryant. Washington needs to keep playing these guys. Sure, the game was over when this all happened but they all provided something. Thomas Bryant is the main player in this category. He looked like he could be a starting center. He drew fouls, grabbed rebounds, and provided a large body in the paint. Bryant did not have the best night but with a little more playing time, he could instantly pass Ian Mahimni and Jason Smith in the rotation.